I love to see how teaching practices play out in different disciplines. Thanks to a pingback on a 2015 blog post of mine, I learned about a really interesting application of in-class polling and debate maps by a visual arts instructor at the University of British Columbia. These are two instructional techniques I often mention in my faculty workshops, and I use them in my own teaching. It’s interesting to see how another instructors adapts them to her own teaching context, in a discipline far afield from my own discipline of mathematics. In her online teaching portfolio, Christine D’Onofrio details a lecture-lab sequence in one of her visual arts courses. The sequences focuses on the use of appropriation in digital visual arts, that is, the use of borrowed (some might say stolen) elements from prior work in a new piece of art. After sharing some examples and definitions and engaging her students in some discussion, D’Onofrio moves to a particular example of appropriation: Sherrie Levine’s After Walker Evans, a photograph taken in 1981 by Levine of a famous Depression-era photograph by Walker Evans depicting an Alabama sharecropper. This photograph-of-a-photograph has sparked much conversation about appropriation and originality, not unlike the controversy ignited by another “rephotographer,” Richard Prince, who debuted an exhibition in 2014 that consisted almost entirely of other people’s Instagram posts. D’Onofrio asks her students two questions about After Walker Evans: How does this work function as Art? And, How does this work function as Theft (or not art)? Students respond to the open-ended questions using a classroom response system (Top Hat, in this case). This allows D’Onofrio not only to share the collected responses with her students during class, but also to have the students work with the responses further during lab. She prints about 50 of the “most interesting and diverse” student answers from class on index cards, then directs her TAs to have students work in lab to create a debate map with the index cards. 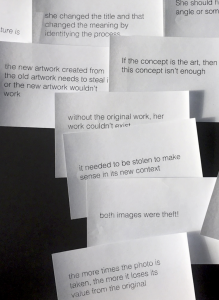 The students post the index cards to a board or lay them out flat on a table, seeking to arrange them in some structure that reflects the shape of the art-theft debate. Students might cluster similar arguments together or visually juxtapose arguments and counter-arguments or create negative space that shows an important fault line in the art-theft debate. TAs keep a few blank index cards handy for students to add arguments to the map, and they are encouraged to ask students where they see themselves on the map, or to pick an index card that best represents their take on the topic. I found out about D’Onofrio’s lesson plan because she linked to my 2015 blog post about the debate map activity I use in my cryptography course. (Thank you, pingbacks!) I have found the activity very useful for helping students see nuance and structure in a complex topic. In my case, it’s the tension between surveillance and privacy. In D’Onofrio’s case, it’s a controversial topic in the art world, one that can inform how her visual arts students think about the originality in their own work. I really like the structure she uses in the lecture-lab sequence, in which students generate lots of diverse perspectives, which are captured using a bit of technology, then turned back to the students for analysis. I think that’s a smart way to use a classroom response system, since it asks students to do more of the cognitive heavy lifting. I’ve argued in the past that the classic Think-Pair-Share discussion structure could sometimes benefit from a fourth -Analysis step, and D’Onofrio’s lesson plan is a great example of what that can look like. She doesn’t say what kind of learning she observes in her students following this sequence, but I suspect they leave class with a richer understanding of this complex topic and a better sense of their own position within the debate. Have you used a debate map in your class? Or turned the results of a polling question over to your students for analysis? I would love to hear about other examples along these lines.